The 2016 venture environment remained relatively healthy. Deal count and aggregate transaction value for the year did decline significantly from 2015, but whereas the froth in 2014 and 2015 was forged by mega-rounds and new unicorns, 2016 saw investment pace return to a more manageable level. The recent falloff should be viewed more as a regression to the mean, rather than an industry-wide decline. The 2016 median round size of completed early-stage deals grew significantly over 2015, proving even more that investors are still willing to make investments in the right opportunity. Late-stage deals did see a slight fall in the median deal size, but it still finished the year with the second-highest median in a decade. Nearly 70% of completed transactions were of at least $1 million, the highest percentage in the last seven years, and 2016 marked the second consecutive year that deals of $25 million+ have accounted for more than 60% of all VC invested in the US. Angel and seed activity has fallen 43% in just six quarters, seeing a decline each quarter during that time. 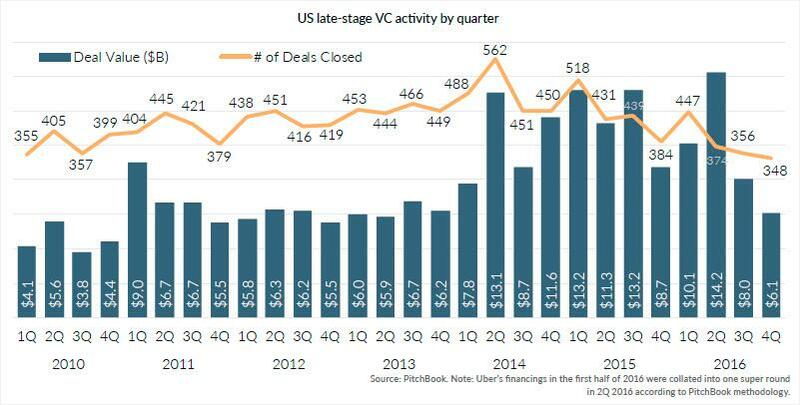 4Q was also the first time since 4Q 2012 that the stage was unable to reach the 1,000-deal mark. Still, $1.45 billion was invested in angel & seed deals during the quarter and more than $6.6 billion was invested during the year. As the early stage has seen deal sizes continue to rise, total capital invested in the stage remains historically high despite a slide in overall deal activity. The late stage saw the largest falloff in capital invested over the past couple of quarters. The drop was fueled by the significant fall in financings of $100 million or more, which dropped by 40% from 2015 (98) to 2016 (59). 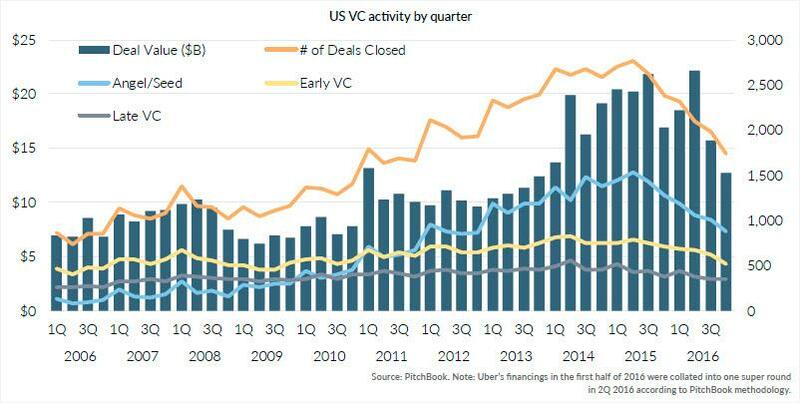 The record amount invested in 2Q was largely due to the closing of Uber's mega-round. Corporate venture activity has grown in popularity as a cost-effective way to innovate technology and streamline back-end processes for corporations of all size. Aside from Intel, Comcast and Microsoft, three of the best-known CVCs, 2016 saw the entrance of Campbell Soup Company, JetBlue and Sesame Street to the market. 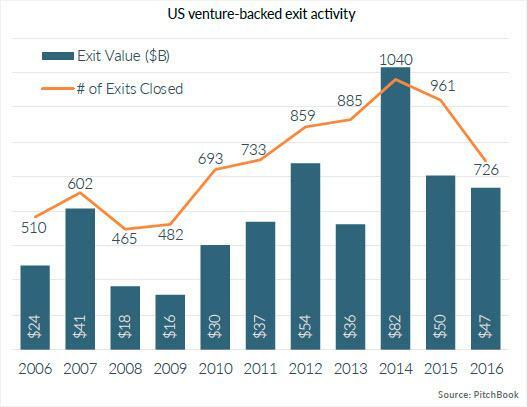 US venture-backed exit activity was a major focal point throughout the year, and the lack of an IPO market was especially worrisome to investors. Fewer IPOs were completed in the US than in any year since 2009, and the acquisition market lagged behind the past several years. The VC fundraising environment during 2016 was particularly friendly to investors. 87% of funds closed during the year were able to hit their target—the highest percentage in a decade—and the year ended with a record amount of commitments ($42 billion) across 253 vehicles. 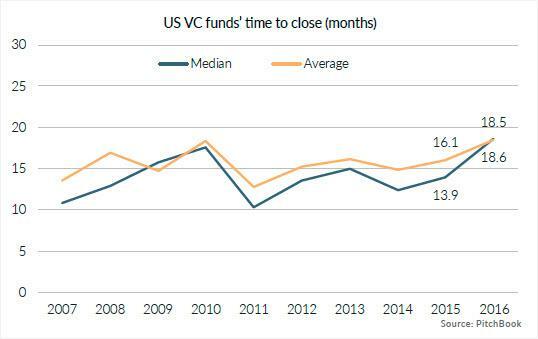 For more analysis on the US venture industry, download the latest PitchBook-NVCA Venture Monitor.